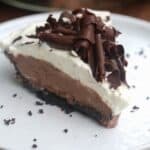 This amazing Chocolate Cream Pie has an easy homemade chocolate pudding layered inside an Oreo pie crust and topped with sweetened whipped cream and chocolate curls. Homemade pies are kinda like my favorite thing ever. My mom and grandma taught me how to make homemade pie crust when I was really, really young, and every Thanksgiving since I can remember they would assign several pies to me to make. I LOVED it, and they loved the extra help. 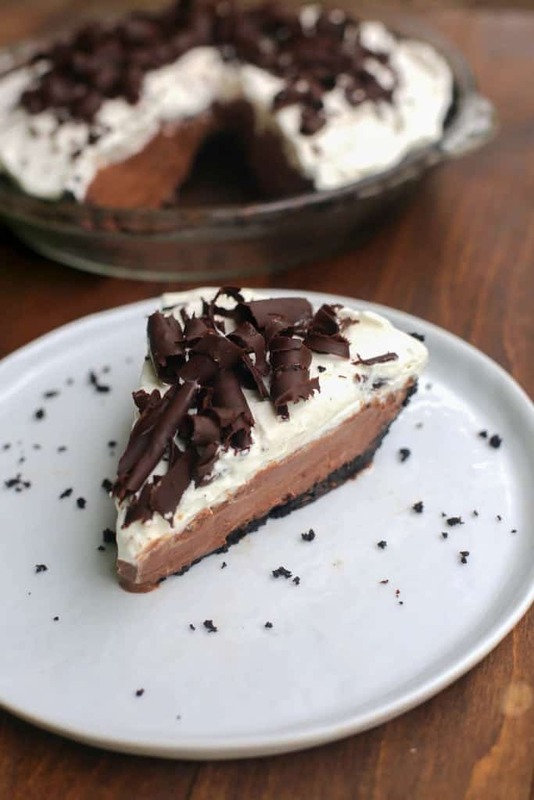 This Chocolate Cream Pie is PERFECT in so many ways. 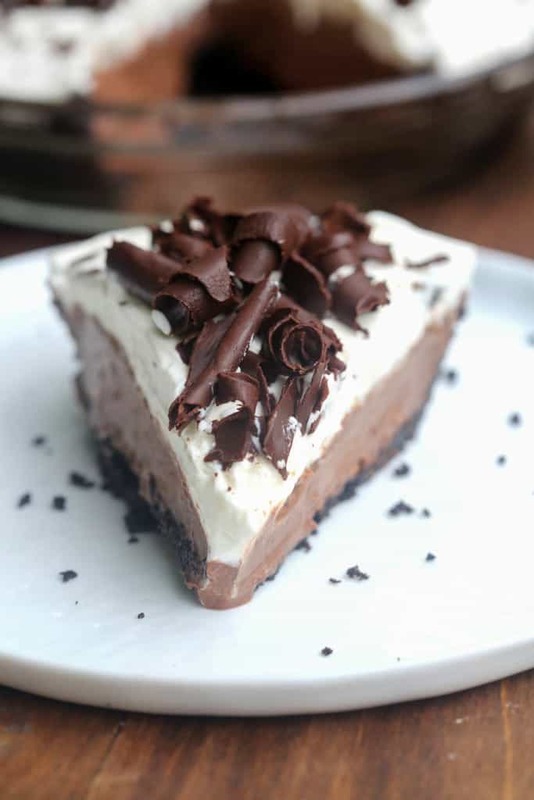 It’s perfect for any time of year–especially for summer time if you’re looking for an (almost) no bake chocolate pie recipe. It’s perfect in the way it holds together. 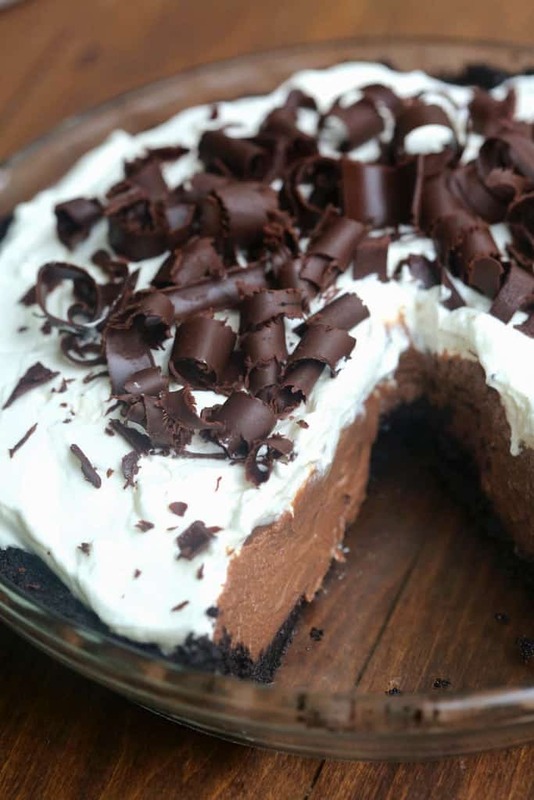 Unlike so many pudding pies you may have attempted in the past, this Chocolate Cream Pie will hold together perfectly. You don’t have to worry about the pudding layer falling apart when you cut a slice. And, it’s PERFECT in flavor. It’s smooth and creamy with the most over-the-top rich chocolate flavor. And can you get better than an Oreo cookie crust? Nope. Total bonus that it’s super easy to make. Add Oreo cookies to a food processor and pulse into a fine crumb. Pour the crumbs into a bowl and stir in melted butter until combined. Press mixture evenly and firmly into the bottom and up the sides of a 9in pie dish. Bake for 10-12 minutes. Set aside to cool. To a medium sauce pan over medium heat, add the sugar, and milk and whisk well to combine. Bring mixture to a simmer, whisking frequently. Meanwhile, add the egg yolks and cornstarch to a bowl and whisk until smooth. Once the saucepan mixture is simmering, add a few spoonfuls of the hot liquid into the egg yolks and whisk to temper the eggs. Add a few more spoonfuls of the hot liquid into the egg yolks. Then slowly whisk the egg yolk mixture into the remaining mixture in the saucepan. Whisk constantly until the mixture begins to thicken and comes to a very gently boil (big bubbles begin to break the surface). Remove pan from the heat and whisk in the butter, chopped chocolate, and vanilla extract. Stir well until completely smooth. Pour filling into the cooled cookie crust and smooth into an even layer. Place a piece of plastic wrap gently on top and refrigerate until filling is set, about 4–6 hours or overnight, if desired. Once pudding has set, make the topping by adding the cream to a mixing bowl. Mix with electric mixers on high speed for 1-2 minutes. Add the sugar and vanilla extract. Continue mixing until soft peaks form, about 2-3 minutes. 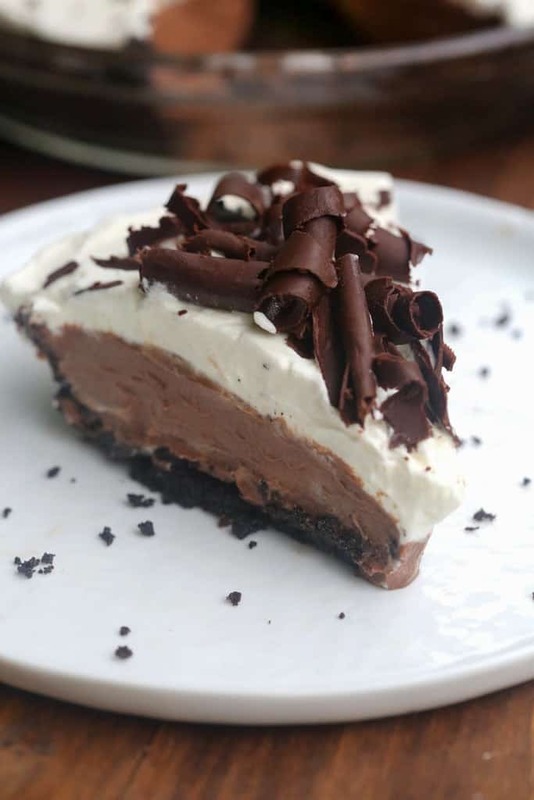 Spread whipped cream over pie and garnish with curled chocolate, if desired. (I use this method for making chocolate curls). I’m so happy to hear that! Yes, that would be fine.